Please Try Again , Time Out!!! Bring out the charm of ethnicity with Pick Any One Kanjeevaram Silk Saree by Zuri (KSS10), must-have addition to your saree collection. Made from Silk fabric, they are lightweight, easy to drape and comfortable to wear all day long. The sarees are embellished with glamorous designs, gorgeous colours and designer appeal to look evergreen always. The complimenting blouse with the saree enhances the overall look at all social events. Add in Wishlist Please click to add in your Wishlist. Disclaimer: Product shown in the picture above is only for representative and information purposes. The actual product delivered may be different from the creative as displayed here in the website. When it comes to buying a saree for weddings or other special occasions, considering Art Silk saree is the best choice to pick. However, buying a silk saree on an occasion every time may burn a hole in your pocket. Keeping everything in mind, we reviewed Pick Any One Kanjeevaram Silk Saree by Zuri (KSS10) which is apt for grand occasions. Material: Crafted from Silk, the fabric is of finest quality providing maximum comfort to the wearer. The look and feel of the fabric are so much alike of real silk. Moreover, they are porous, delicate and lightweight in nature that gives you weightless feel when worn for long hours. Durability: The sarees can be easily washed at home. The prints and designs do not fade away even when washed several times. Maintenance: The maintenance of these sarees is not a costly affair. Using plain cold water either by hand wash or machine wash condition them and keep it fresh for longer. Also, dry cleaning is not required for these sarees. Style Tip: Club it with simple jewellery, a pair of sandals/heels and minimal make-up. Perfect for your grand occasions. We would highly recommend buying Pick Any One Kanjeevaram Silk Saree by Zuri (KSS10) that will make you look vivacious be it a wedding, family functions or evening parties. The combo is totally worth the purchase. Be the first to Write review on this product. Send me email notification whenever someone answers this question. Be the first to Ask Question on this product. Pick Any One Assorted Kanjeevaram..VSKanjeevaram Art Silk Saree - Pick.. Pick Any One Assorted Kanjeevaram.. VS Kanjeevaram Art Silk Saree - Pick.. Pick Any One Assorted Kanjeevaram..VSPick Any One Kanjeevaram Silk Sar.. Pick Any One Assorted Kanjeevaram.. VS Pick Any One Kanjeevaram Silk Sar.. Pick Any One Assorted Kanjeevaram..VSPick Any One Kutch Embroidered Sa.. Pick Any One Assorted Kanjeevaram.. VS Pick Any One Kutch Embroidered Sa.. 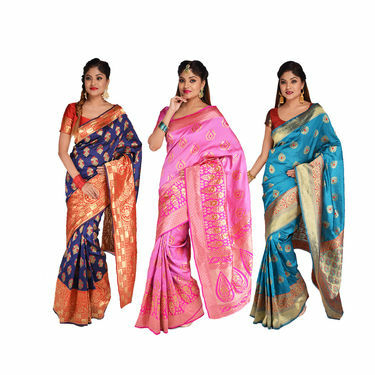 Pick Any One Assorted Kanjeevaram..VSRadhika Pack of 4 Printed Georget.. Pick Any One Assorted Kanjeevaram.. VS Radhika Pack of 4 Printed Georget.. Pick Any One Assorted Kanjeevaram..VSDeepika Collection of 4 Printed G.. Pick Any One Assorted Kanjeevaram.. VS Deepika Collection of 4 Printed G.. Pick Any One Assorted Kanjeevaram..VSPick Any One Georgette Saree with.. 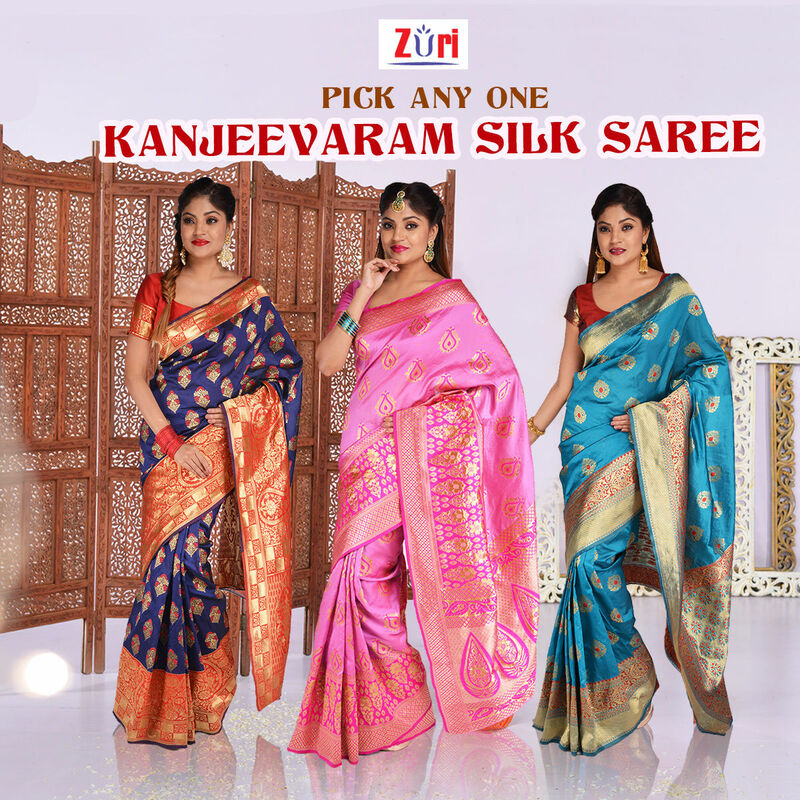 Pick Any One Assorted Kanjeevaram.. VS Pick Any One Georgette Saree with.. Pick Any One Assorted Kanjeevaram..VSPack of 9 Assorted Printed George.. Pick Any One Assorted Kanjeevaram.. VS Pack of 9 Assorted Printed George..
for all your lifestyle needs. Being the No.1 home shopping company of India, Naaptol aims at improving people's lives by catering to them, through teleshopping and online shopping, a gamut of products aimed at simplifying their life.Naaptol epitomizes accessible and affordable luxury for all. The brand prides itself on high quality, state-of-the-art, affordable, innovative consumer goods and lifestyle products and experienced staff ensuring our customers simplify their lives, be healthy, be happy, live well and above all enjoy their lives. From home decor to apparels to toys to kitchen appliances, the brand encapsulates fashion, luxury, comfort and style to its product portfolio combining innovation, affordability and modernity. , Naaptol reaches maximum consumers, not just in metros but also in the smallest possible towns. We have the deepest delivery penetration and serve 24000 pincodes in India- the highest among all ecommerce players. Associated with some of the big national brands like Samsung, Kindle, Thomas Cook, Lenovo, FujiFilm & Yamaha, Naaptol has evolved to keep pace with its customer's changing lifestyles and global challenges. We take our customers to higher levels of comfort and confidence by making them look, feel and live better. With a deep rooted vision of "Catering to the aspirations of each Bharatwasi by providing world-class innovative offers " combined with continuous innovation, constant upgradation of cutting-edge technology and customer-centric approach, Naaptol continues to upgrade the lives of its consumers and "Delivering happiness". Disclaimer: Products & warranty by 3rd Party Vendors. Brands, Logos, Creatives, Trademarks, Copyrights are owned by their respective owners. Naaptol disclaims liability for violation of any 3rd party rights. Regulatory Compliance: In compliance of the Telecommunication (Broadcasting and Cable) Services Interconnection (Addressable Systems) Regulation, 2017 dated 03rd March 2017 read with Telecommunication (Broadcasting and Cable) Services (Eight) (Addressable Systems) Tariff Order, 2017 and subsequent communications from TRAI (Telecom Regulatory Authority of India) on the subject, please find below the details of our channels as follows :.